Citizens from over 70 nations will be able to vote in the UK referendum on Britain’s membership of the EU. But most European Union nationalities will be excluded. But the voting franchise on who can vote in the UK has more to do with Britain’s distant past than its future. Its roots go back to Britain’s Empire, when countries across the world were ruled by Great Britain. At one time or another, Britain invaded almost 90% of the world’s nations. At the Empire’s peak, atlases showed half the world coloured pink, signifying British rule. Over time, as the British reign softened, many of these countries became self-governing whilst retaining Britain’s monarch as Head of State. The Commonwealth of British Nations was formed in 1949 with membership on a voluntary basis. The last two countries to join The Commonwealth – Rwanda and Mozambique – have no ties with Britain’s Empire. Commonwealth citizens are not regarded in law as foreigners in the UK. This is a legacy of the situation that existed before 1949 when they had the status of ‘British subjects’. 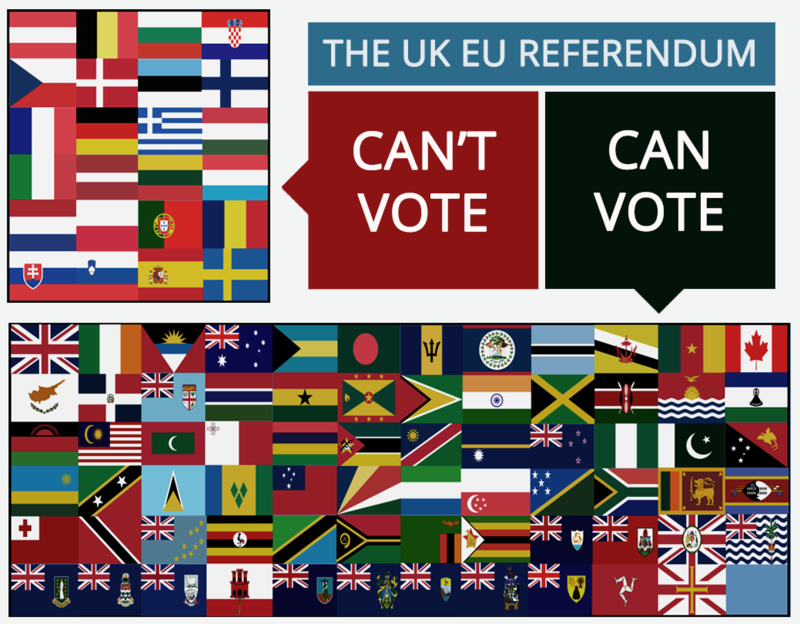 Including Britain, 55 countries across the world are members of The Commonwealth, and all citizens from those countries resident with ‘leave-to-remain’ in the UK will be able to vote in the referendum. They include citizens living in the UK from Australia, Canada, Ghana, Malaysia, India, Pakistan, Singapore, South Africa, Uganda and Zimbabwe. Just two EU countries are members of the Commonwealth, Malta and Cyprus, and citizens from those countries resident in the UK will also get a vote. In addition, citizens living in the UK from 15 ‘British Overseas Territories’ will also have a say on Britain’s future in Europe, including those from Anguilla, Bermuda, Cayman Islands and Montserrat. The British government has announced that residents of its Overseas Territory, Gibraltar, whether living there or here, will also be able to vote in the Referendum. Citizens of the British Crown Dependents of the Isle of Man and the Channel Island also have the vote. And as a result of a special treaty signed between Britain and Ireland, Irish citizens living in the UK will also have a vote in the referendum. But citizens from 24 EU countries who have made Britain their home, who reside here, work here, pay taxes here and many of whom have started families here, will have no vote on whether Britain will stay a member of the EU, even though the decision directly affects them. Many of these EU citizens have been living in Britain for over 30 years. They hadn’t taken out British citizenship because, under EU rules, they all have European Citizenship, meaning that, like all EU nationalities, they can move to any other EU country and enjoy the same rights as native citizens of that country. Except that residents here from other EU countries do not enjoy the same voting rights as British citizens – or those of over 70 nationalities, who because of Britain’s imperial past, still retain the historical right to vote in our General Elections and the forthcoming referendum if they are resident here. EU migrants resident in the UK can already vote in Britain’s local and European elections, and could vote in last year’s Scottish referendum, so why not the forthcoming EU referendum, too? EU citizens living in the UK who will be denied a referendum vote include French, German, Italian, Spanish, Polish, Danish, Romanian and Swedish residents, whilst those living here from nations including Grenada, Kenya, Mozambique, Nigeria, the Seychelles and Sri Lanka will have a say on Britain’s future in the EU. Also excluded from the referendum vote will be British citizens who have lived abroad for over 15 years – an arcane rule that the new Conservative government has pledged to scrap. In future, all Britons, wherever they live, will enjoy ‘Votes for Life’ – but it’s been announced this week that the rule-change won’t come in time for the referendum. Uniquely for the referendum, members of the House of Lords will be given a vote, but unlike in last year’s Scottish referendum on independence, 16 and 17 year-olds will not. However, the fact that the UK government can amend the rules on who can vote in the referendum, means that it is politically and practically possible to change the voting franchise for what will be a once-in-a-generation (or-two) event. Yesterday I contacted No 10 Downing Street, the home of British Prime Minister, David Cameron. A spokesman told me that the voting rights and rules for the referendum will be broadly the same as those of a British General Election. But, he added, it would be subject to the consent of Parliament. Maybe our Members of Parliament will see sense and realise that there is a serious democratic deficit in allowing so many different nationalities to vote in the forthcoming EU referendum, but to specifically exclude most nationalities living here from the rest of Europe, as well as denying a vote to many British people living abroad. This entry was posted in Current Affairs, Democracy & Citizenship, Global & International, Law & Justice, Politics & Public Policy, Society & Culture, The EU and tagged British Empire, Commonwealth, democracy, European Union, General Election, referendum, voting rights. Bookmark the permalink. 20 Responses to The EU Referendum – who can and can’t vote? Couldn’t agree more Jon! Great article. I think it is unfair that an EU citizen who might even have British children couldn’t vote in this referendum! There is plenty of time for those long term EU citizens to apply for citizenship, if it is such a big concern. And whilst I agree with you that the citizens of the commonwealth and their status within voter registration is odd, it is not new, this has been the case for a very long time. Little reason to change it now, the numbers are actually very small, as you know. And voting participation pretty low too. You were very keen to see no referendum on the question of Britain remaining within the EU, you endorsed the Labour Party at the GE in order that it wouldn’t happen, which rather backfired when over half of the population voted for the 3 parties specifically promising a referendum. The 2 national parties that disallowed a referendum were punished for their intransigence and did very badly. So it appears disingenuous to position this faux outrage on a democratic deficit, we find that problem in Brussels, you wish to see approximately 3.5 million voters added to the IN count, nothing more nothing less. Did you care when the non Dutch EU citizens could not vote on the referendum concerning the EU constitution, or the non French EU citizens on the same thing, I doubt it. And incidentally it was the Labour Party, that you endorsed, that changed the rule to 15 years for British residents abroad, for entirely self serving reasons, us older folks tended to vote Tory. That this spiteful measure has come back to bite them on the arse, makes the fact that I cannot vote in this referendum somewhat easier to digest. If the Tory Party were in coalition with the Lib Dems, 16 plus would have been enacted for voter registration, but the Conservatives hold a slender majority, and our PM will have his feet held to the fire by the eurosceptic wing of his party, which is watching him like a hawk. So there is no chance, rightly I think. And I would recommend the House Of Lords not to consider wrecking motions on this, there is a well understood protocol that the Lords do not block or attach wrecking motions to Government Manifesto Pledges, they are not elected and should step very warily, the Demos are not well minded to our Politicians at the moment. Unelected politicians in Brussels and the Lords will swing the vote to exit by behaving in a manner against the very thing that has just had an election to settle. As an aside, I am a little disappointed you haven’t written on where British negotiations should be heading, what could be achieved, what would be helpful to the EU in terms of change. Euro sceptic bloggers write about nothing else, many would vote to stay IN if sensible negotiations were concluded successfully. All Europhiles, including yourself, admit that the EU needs to change, adapt in some way, yet you never indicate how. Either the Europhile commentariat don’t know, or don’t believe that change is really needed. Roy, you are starting to attack me personally, which isn’t a pleasant style of debating, and not something I wish to indulge in. You also make assumptions. For example, I have often written that I want to see more democratisation of the EU. However, I am strongly against dismantling the founding principles of the EU, such as free movement of people. I am also in favour of closer union, not less. Just because I wrote a blog that Labour offered the most certainty for our continued membership of the European Union, it cannot be extrapolated that I therefore agree with all Labour policies – which I certainly don’t, and certainly didn’t. 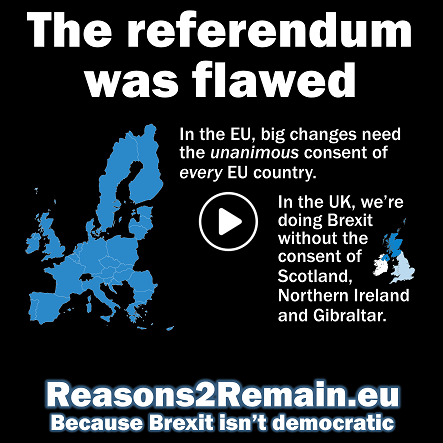 Also, I have never postulated that we should never have a referendum – it was always about when, not if. Now that we are to have a referendum, I am keen to see that the voting franchise is a fair one. In my view, excluding EU migrants living here would not be fair – just as it would not be fair if the same thing was to happen in any other EU state holding a referendum. I believe in reform, and constantly striving to make improvements, so it’s ridiculous to assume that I don’t favour reform of the EU. However, I believe that the EU is a reforming organisation, otherwise we would not have witnessed so many wide-reaching new Treaties in our lifetime. Of course there needs to be many more reforms of the EU, and I hope our Prime Minister is successful in reaching agreements with our EU allies to achieve reforms that will be welcomed by all the other EU members and be of benefit to us all. I am certainly not attacking you personally Jon, I am surprised and dismayed that you would think so. I do disagree with much that you write, but that is surely ok. If you put a blog online I presume you are wishing to engage, if you would prefer to only engage with people who think like yourself, then you should be clear about it. Personally I have found that discussion with those that I disagree with sharpens my intellectual argument, speaking to an echo chamber of approval does quite the reverse. I do note that amongst all your protestations there is not one single renegotiation you would like to see, you wish for more democracy within the EU, I see that and happily we agree. There are 28 nation states within the EU, each appoints a Commissioner, and in turn each is approved by the European Parliament. The President of the Commission is selected by the Parliament and approved by the Council of Ministers, on a majority vote. As you know this arrangement causes those of us on the sceptic side of the argument to question the Democracy underpinning the project. Why not elect each of the Commissioners via a national vote, each country elects rather than appoints it’s Commissioner. Each Commissioner selects a portfolio they would like to re parent, trade, finance, justice etc and campaigns to the European Parliament and is elected by majority vote by the MEPs. The President of the Commission would be FPTP by the electorate of Europe, as a whole. This system would mean that never again would we have an unknown second rate politician appointed President that an electorate never had the opportunity to chose, like Juncker. What changes would you like to see. Roy, sorry to get your name wrong, now corrected. Of course, I welcome debate and exchange of ideas, which I cherish. We just need to avoid attacks against the person, or making comments too personal. I think there is merit in your ideas for more democratisation of the EU. In the past 40 years there has been considerable devolution of power to the European Parliament, and I want to see that continue. For example, I want to see the European Parliament having more powers to initiate legislation, and not just to consider legislation put forward by the Commission. 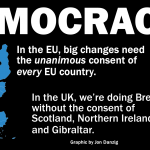 I am also highly critical of our own democracy here in the UK, where we still have an unelected second chamber, and the first-past-the post system can result in large numbers of people voting for a party and only have one or a few seats. That to me seems undemocratic. I propose reform, rather than dismantlement; staying, rather than leaving. I couldn’t agree with you more about an unelected second house, it is a nonsense. FPTP though I am less certain about, I understand the arguments for PR, and as someone who supports a Party that received 4 million votes and yet only one seat, it has obvious attractions. I think though we should give FPTP a while yet, see how a 2 party voting system works in a multi party environment. I thought the last Coalition did pretty well and having a small majority certainly ensures Ministers remain focused. So for now, I would leave it be. However, let us return to the EU. I do not really understand your plan of enabling the Parliament to introduce Legislation, is that not the main role of the Commission. How much do you envision, and what basis, with what constraint. I think it opens the door even wider to one of the main problems I have with the entire construct of the EU. No one can really argue that individual MEPs actually represent their constituents. Very few people, across Europe actually bother to vote, the number doing so is declining markedly. Those that do, often have no idea who they are voting for and little idea of what the MEP will do when he is elected. So an MEP is in practical terms entirely remote from the Demos of Europe, if one even exists. What MEPs are not remote from is the army of Lobyists, NGOs and Think Tanks that now carpet Brussels. Access to MEPs is considerably easier for the Lobbying industry than access to the Commission, so what we already see is the Lobbying industry using the Parliament to effectively lobby on their behalf to introduce legislation or regulations that are helpful to their clients. There needs to be far more transparency on this issue. At present the Parliament may vote to end the term of Commissioners, as they threatened to do during the corruption of the Santos Commission, causing their resignation. I would prefer to see the Commissioners and President directly elected, not appointed, as I suggested in a previous post, in the case of a directly elected Commission obviously the Parliament would lose this ability. 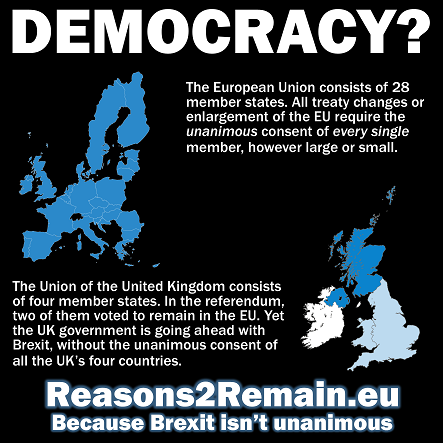 However it is extremely unlikely the EU could accept such a degree of Democracy into the system. So it is vital that the Council of Ministers also has the power to dismiss a Commissioner or an entire Commission, by the same majority vote as exercised by the Parliament. I note that Mr Danzig is once again failing to comprehend the posts of others. He wasn’t personally attacked in the slightest. He was simply being reminded of his convoluted stance on various matters. I don’t recall him ever calling for a referendum on our EU membership, either. David Smith, I have often written that we will need a referendum on EU membership, I doubt you could have read all my articles and postings. I have also written many times that I will welcome a referendum to settle the issue, but felt concerned about the timing and the uncertainty that a long lead-up to a referendum might have on our economy. Regarding making comments personal, to claim (as the previous poster did) that I probably didn’t care that non Dutch EU citizens could not vote on the referendum in Holland concerning the EU constitution is making postings personal and rather presumptuous. I actually think that EU migrants living in all other EU countries should be able to vote in referenda of the country they reside, and to have a choice in which national general elections they participate. Even for you to state I have a ‘convoluted stance on various matters’ is somewhat of a generalised, unspecific slur against me. I do not indulge in these types of comments against others and feel they rather lower the tone of debate. It’s always best to play the ball, and not the man. Thanks for that David, I certainly didn’t think I had in any way personally attacked Jon, and obviously no such intent was meant. All too often though I have noticed that those of a more progressive viewpoint have rather thin skins when their convictions are challenged, an accusation of personal attack, or the talismanic racist card is played when debate is difficult. Jon has assured me he agrees with a referendum, but is seemingly unsure when that should have happened, I don’t believe he was keen for one at the launch of the Euro, the Maastricht Treaty or indeed the Lisbon Treaty. And certainly not now, his rationale for voting Labour appeared only on the basis of denying a referendum. It is difficult to imagine the circumstances that would ignite his enthusiasm. A referendum to a Europhile is akin to garlic to a vampire, abhorrent, understandable, every time the issue is put the public, the EU fails to win the argument. Jon, I am sorry but I did not say or imply you did not care that EU citizens had no right to vote in the referendums held in Holland and France, merely that you did not comment on them. Unlike EU citizens in the UK who you think should. David and Roy, it’s ridiculous to seemingly have a private conversation about me on my blog page! This is not meant to be a forum about me, and you are making too many assumptions about what my position would be in certain circumstances when you have no evidence of my opinions of those matters. I have never played a ‘talismanic racist card’ (although I am strongly anti-racist); I love difficult debates; you cannot possibly know what I would have thought about a referendum on the Euro, or the Maastricht or Lisbon Treaties; and saying that a referendum to a Europhile is ‘akin to garlic to a vampire’ is quite ridiculous. I relish the referendum, it’s a great opportunity to debate the issue and finally put it to a vote, and as a democrat, I will accept the democratic will of the people, whichever way the vote goes. I think there are more pressing things in the country and the world that the UK should now be putting its attention to, but since we are now to have a referendum, I will participate as fully as I can. Now, please stop this debating and discussing of me; not because I am thin-skinned, but because it’s just unedifying and not the purpose of this blog. Please keep comments about the subject in hand. Now, please, I don’t want to be the subject of this forum discussion. I am happy for the debate to continue, and I welcome divergent views. Please keep on topic, but please don’t try to second-guess what my opinion is on a given subject, why not just openly ask me so I can openly answer..
For someone who relishes the debate you were very keen to avoid it, you advocated voting Labour because they were the Party that refused to give one, which didn’t work out very well, Labour were shunned. 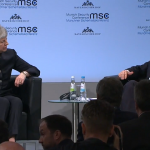 There is much more pressing issues for those that live under the hubristic Euro project, I will grant you that, the negotiations with Greece appear to be unravelling, and the firewalls and lack of systemic risk are to be tested. And you must understand this issue will not be put to bed once and for all when the referendum is held. It has been written into Law, voted by all 3 major parties, endorsed in each of their respective manifestos, that there will be a referendum each time there is treaty change. This referendum, which I expect the yes side to win, is only the beginning. We have to be lucky once, you have to be lucky every time. I think what I said is perfectly clear. I am not suggesting you did not care about Dutch or French citizens, merely that you did not care enough about the process to comment on the fact that no EU citizens were allowed to participate. If you did, please direct me to the commentary, I will be pleased to see that you are consistent in your views. Roy, I am sure we both sincerely hold our views, but we will have to agree to disagree. Your quote, “We have to be lucky once, you have to be lucky every time” is what the IRA used to say; it did send a shiver up my spine. Later this month I am giving a talk on “Where you live is where you vote”. I believe that if you have passed the tests to be able to reside in a country, work there and pay taxes to the government there, then you should be allowed to vote there. This includes French who live in Germany; Spanish who live in France; and of course all those citizens – from the Commonwealth and the European Union and indeed anywhere else- who reside here and have the right to reside here. You may be interested to read my article of two years ago called, The value of being citizens of Europe. I don’t expect you to agree with me, but I hope you will concur that my views are as sincerely held as yours. We are not trying to trick anyone, we are not being disingenuous, we just think differently. And in a modern, vibrant, forward-looking democracy, that’s surely to be encouraged. 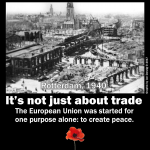 However, I have found that many of the Eurosceptic press have lied and misled their readers on basic information about the European Union, and I have often exposed this on my blogs. I seek truth and information; and I am prepared to change my mind. I don’t think I can say fairer than that. I chose the quote with full knowledge of its provenance Jon, I very much wish to see the EU killed off, peacefully of course via the ballot box, and soon, before it drags more Europeans into poverty, before it’s insatiable desire for enlargement risks setting off more aggression from the Russians, and before yet more sovereignty is grasped from the Nation States of Europe and handed over to a second rate, unelected often democratically rejected collection of non entities in Brussels. And of course I consider you try to represent your views in a sincere manner and without question you seek to do so in an honest manner. If only I had the same faith in the architects of the European Project, those that undoubtedly did lie to persuade the British into remaining within it or indeed the enabler of tax evasion on a monstrous scale who now presides over the whole corrupt edifice of the EU. In their own words Jon, not mine. The following quote is from the founder of the European Movement, Jean Monnet in a private correspondence. Then of course we have Jean Claude Juncker. As I know you are a committed democrat Jon, I cannot understand how these, and there are many, many other quotes I could have selected, do not concern you. It is this tendency to secrecy, to ignoring or brushing aside the Democratic will of citizens, to seek ever greater Political Union at the expense of individual prosperity and freedoms that concern me greatly. Thank you for the link to your previous article, as ever well written, informative and interesting. And yes I am afraid you are correct, I do not see harmonious, profitable coexistence amongst the peoples of Europe being a precondition of Political Union, I would argue the reverse is true, as the periphery nations of the EZ get poorer, the dislike of the successful winners, Germany, increases. As ever though it is the comments that piqued my interest more than the article. I note that you voted NO 40 years ago, which was amusing, you share your early Euro scepticism with Tony Bair. Where you did disappoint was your assertion that having voted in a referendum in 1975, you thought that no further gauge of public opinion was required in your lifetime, I find that extraordinary, in our exchanges you have always given the impression that a referendum was to be welcomed, I had no idea you were seeking to delay it for an entire lifetime, even Nick Clegg I think anticipated being alive to see it. Happily though you will, god willing, be able to put a tick in the box again, and no doubt this time you will be on the winning side. Then there will be Treaty Change, and we can do it all over again. Sometimes Jon it is necessary to step back from debate and reflect on the morality of your position. Far too often discussions on the EU and in particular it’s “greatest achievement” the Euro are dragged into the realms of economics and politics. As Greece tries to negotiate the impossible and it’s creditors the EU, ECB and IMF attempts to enforce the unbearable, it is too easy to get lost in the vast amounts of currency involved, the ramifications of actions taken, the political costs involved in decisions made. But, there is a cost that is not counted in ledger books or weighed in votes. There is a human cost. These closing paragraphs from a New York Times article should be required reading for the Europhile commentariat, it is precisely what Nobel Prize winning Economist Milton Friedman warned against at the launch of the Euro, it would not just be economically unstable, politically dangerous but morally questionable. “Sitting at his desk at the start of yet another 20-hour-plus workday, Theodoros Giannaros, the head of Elpis Hospital in Athens, chain-smoked cigarettes and signed off on a pile of spending requests he said he knew would not be fulfilled. Since he started work at the hospital in 2010, Giannaros has seen his salary shrink to 1,200 euros a month, from 7,400 euros. His annual budget, once 20 million euros, is now 6 million euros, and the number of practicing doctors has been reduced to 200 from 250. Like almost everyone in Greece, he is making do with less. The hospital recycles instruments; buys the cheapest surgical gloves on the market (they occasionally rip in the middle of operations, Giannaros says); and uses primarily generic drugs. Giannaros, 58, says he recently suffered a heart attack from the constant stress. But he says it is his surgeons he worries about most. Striding across the hospital grounds, Giannaros waved over his star surgeon, Dimitris Tsantzalos. “About 1,500,” said Tsantzalos, who, with his strapping build, seems younger than his 63 years. A week later, a tragedy struck Giannaros: His 26-year-old son, Patrick, committed suicide by jumping in front of an Athens subway train. His son had finished his university studies and, unable to find work in a country where more than half the young are jobless, was helping his father at the hospital. While Giannaros said he understood the importance of staying current with important creditors like the IMF, he said enough was enough. I have a good friend who works at a high level within the Treasury Dept of a very large pharmaceutical company based in Switzerland. He was recently approached by a fairly junior member of staff within the external accounting department. She was in floods of tears. Greece have not paid their bills for drugs supplied for many, many months, the junior member of staff knew that if she brought this to the attention of her managers, a probable result would be the cessation of supply to Greece until remittance was made. In all likelihood advance payment would be demanded. So she made the decision to obscure the non payment, hoping that things would be resolved, of course now she fears that this will not happen. My friend has decided to carry on the cover up, in effect using Treasury funds to cover the bills, using an unauthorised inter company loan, both will lose their jobs if discovered. As a medical journalist I am sure you can guess the possible name of the company, it’s a choice of two basically, both supply drugs for which there is no generic alternative, both supply drugs that treat the most serious of conditions. The EU is fully aware that Greece cannot afford to pay for drugs and supplies to treat the very sick, yet makes no effort to cover the bills, it’s just a further form of leverage to enforce it’s will on the people of Greece, to teach them a lesson. Sun and SOS, apparently broadly pro EU. BBC- positive to the EU. Your comments are becoming longer than my articles, Roy. Why not create your own blog so I can republish all mine on yours? I have not been able to check the veracity of all your statements and quotes, some of which seem anecdotal. I don’t think Edward Heath lied. In any event he was acting on the authority and approval of our British Parliament. Please note that ‘excessive multiple postings’ and repeated ‘overly long postings’ are considered a form of spam and bad internet etiquette. Your postings may be marked as ‘spam’ if you continue with this technique which is not acceptable on any blog. Divergent views are welcome but you need to show some more respect for other peoples blogs.